I've got some new storytime favorites to share today! I've used all of these books in storytimes over the past couple weeks and they made great readalouds. Hilda Must Be Dancing by Karma Wilson. I start this one by asking what kind of animal is on the cover. At least one kid will know that it's a hippo and I then ask if a hippo is a big animal or a small animal. 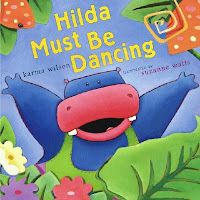 Hilda is a hippo who loves to dance. And when Hilda is dancing, everyone knows it from the booms and crashes that echo across the jungle. Hilda's driving everyone crazy and they all try to find her new hobbies, to no avail. This book's got a great rhyme scheme and lots of good vocabulary and sound words (like boom, crash, splish, etc.). Great for phonological awareness. Plus, it's an entertaining story and has big, bright pictures. 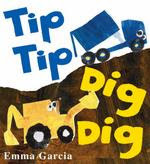 Tip Tip Dig Dig by Emma Garcia. Brightly colored machinery shows just what we can do with a dirty old lot... turn it into a beautiful park! Each machine does something different and you can have the audience motion along with you as you read. The mixer mixes, the bulldozer pushes, etc. The very simple text makes this one great for a younger crowd. At the end of the book, the whole sequence of movements is repeated and I like to go through them super fast at the end! 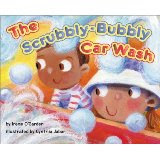 The Scrubbly Bubbly Carwash by Irene O'Garden. The fun sounds in this book make it a real winner for storytime. When the car gets dirty, do we put it in the bathtub? The washing machine? NO! We take it to the scrubbly bubbly car wash! Going through a car wash is something a lot of kids can relate to and the funny, silly language is as much fun to say as it is to hear. This is another great book for phonological awareness. This is a great shorter book for a break between longer stories, too. 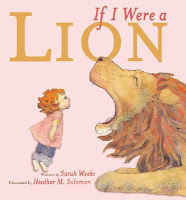 If I Were a Lion by Sarah Weeks. Mama's put her in the corner, but this little protests that she can't possibly be wild... Wild is claws and fangs and biting and scratching! As the book continues we get plenty of hints about why her mother might call her wild. Spilled cereal and drawings on the wall are just the first of many hints at the beginning of the book. Nice rhyming text and detailed illustrations showing the girl's powerful imagination make this a great choice for older preschoolers or maybe even lower elementary students. I had success with it at storytime, but it would be great for one-on-one reading, too, because there are lots of details in the illustrations that might be missed in a group reading. 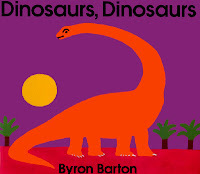 Dinosaurs, Dinosaurs by Byron Barton. What little kid doesn't like dinosaurs? The simple text of this book about dinosaurs makes it easy to add your own words and get the kids' input. For example, you can count the baby dinosaurs on the first page. When the dinosaurs are fierce you can get the kids to show you their fierce faces. When the dinosaurs are scared you can ask the kids why they might be scared. Although the text is simple, there's lots to talk about in this book and the subject is sure to hold their interest. These have been some of my favorite recent storytime books... What are yours? I finally sat down and thought about my own storytime favorites. Here's my post. Thanks for getting the wheels turning!